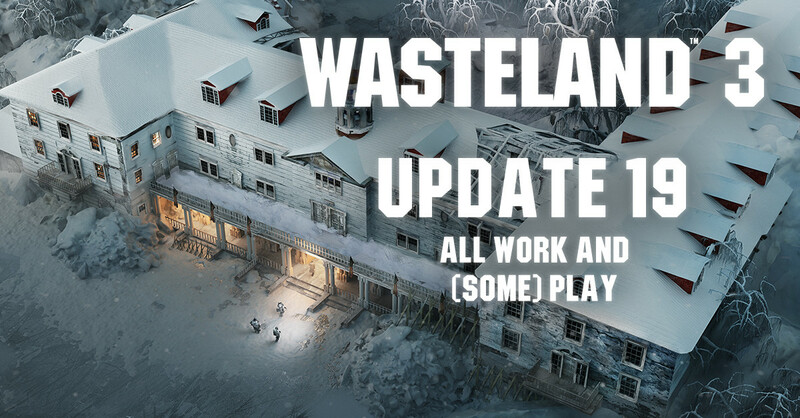 Today we've got a new Wasteland 3 update for you (https://www.fig.co/campaigns/wasteland- ... 57#updates), featuring an examination of some of the technology being developed for the game and a first look at a new game location: the eerie, yet curiously comfortable Stanley Hotel! "When the bombs fell in 1998, the hotel guests watched mushroom clouds rise over the mountains and listened to the world end over the radio. They talked long into the night about what the future held. Then, over the next few days, they had final, sumptuous meals before wandering into the surrounding forest to hang themselves. Only the caretakers remained - employees, at first, and then people seduced by the idea that they could bring back a certain elegance to the world." Very morbid. I like that a lot. Perhaps because your profile pic makes it look like you're ready to chop down some gallows trees! The dead have no need for shinies anyway. I leave one per corpse for the ferryman though. That's what we call "wasteland noble." These guys want to bring some sort of er, demented civility to the wastes, and they can't even keep up with the roof maintenance? Pffft. Someone tell these lazy bums to get on the roof and get to work. Interesting info, but some meat would be nice. I'm pretty much on board with aesthetics, it's the mechanics I'm most concerned about. Needs a hedge maze dungeon. I'm not afraid of no Shrubbery. "Oh, what sad times are these when passing rangers can say Ni at will to old ladies. There is a pestilence upon this land, nothing is sacred." Roof damage- probably a fire. Shrubbery- can the shrubbery attack us in any way? I think we're overdue for some Wasteland 1 style enemy portraits. The three frame gif things would tower over the players. Weren't there trees in Dragon Wars? This is where the chatter about the new Update is so, first up in "I don't want to make the programmers cry but if it happens it happens": As much as they like the snow, I'll want to turn it off. Anything to save ram or lagspeed or SOMEthing that'll need some way to cope with a thing that isn't working the way some guy said it would. The game can be more barebones than you think it should because graphics don't matter if the game is entertaining. Snow only needs to be white. Yes, I know, shaddup. I like the idea of the hotel being used like some sort of Suicide Forest, Japan in the middle of Colorado. While a Shining shout-out or two is as a given as it's gonna get, I'd expect the search-lore to be more involved than something that easy. Is the sausage suspect, but of what? Does the blood elevator have anything to do with the Blood Temple from Needles? Did the Writer in the Hotel (WL1) ever finish his book? If you sell goods out of a cave in the middle of winter, do you still get cabin fever? All those dead, where did they come from and would anyone try to stop them? There may be a "race for time" NPC to join the team. Aside from the snow, program-wise, it sounds like a nice area of the game.